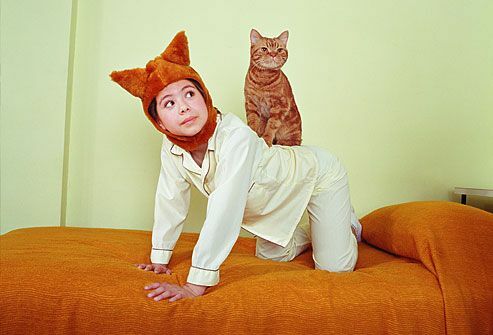 Offer up a few ideas for creative ways to move, and then let your kids' imaginations run free. Encourage them to bend all around like a tree swaying in the wind. Or they can use their arms to spin like a helicopter or zoom like a fire truck through the streets. Show them how to use their arms and legs to cut like scissors or twist their bodies into shapes of letters of the alphabet. Bowling. 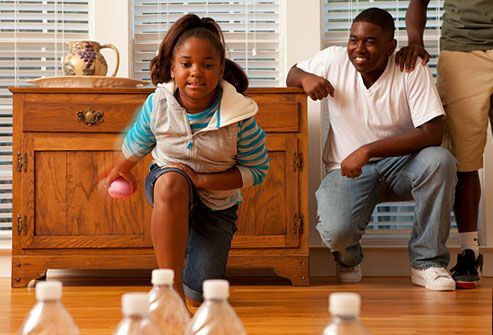 Set up empty water bottles and knock 'em down with a ball. Hockey. Grab a squishy ball for a puck and brooms for sticks. Volleyball. Stretch a piece of string or yarn between two chairs. Hit a balloon back and forth over the line while sitting, on your knees, or with your feet. Head to the garage -- or clear some space -- for some Hula-Hoop fun. 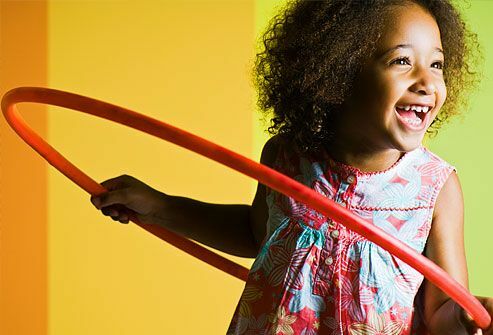 Kids can exercise different parts of the body by hooping around their waists, arms, or legs. Lay hoops on the floor in patterns so kids can jump from one to another. Or, see who can roll their hoop the farthest. 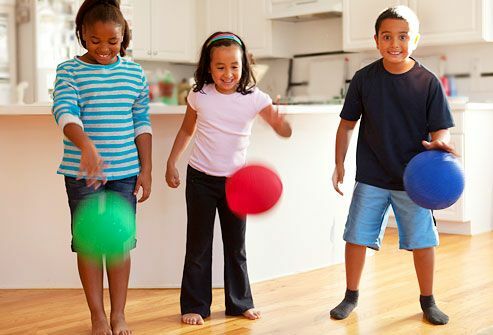 How many ways can your kids bounce a ball? Find out in a room with space to move, a good bouncing floor, and not a lot of breakable stuff. Let them try dribbling close to themselves and far away. Dribble fast and slow. Get a group together and try to bounce balls in sync. When it's nasty or dark outside, dance up a storm inside. Take turns having family members make up their own dances. Teach kids a line dance. Put on music and play “statues,” where everyone must freeze like a statue whenever the music stops. Or just have a dance party with family or friends. Turn your family room into the big top. 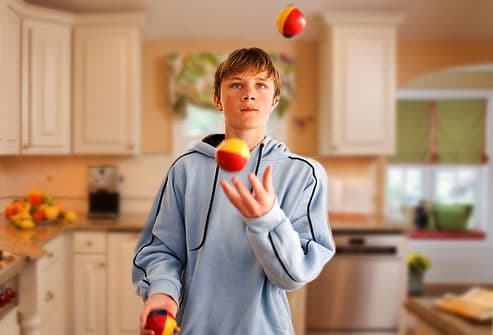 Do balancing stunts, juggle, create tumbling routines, and even get your pet in the act. If you're feeling especially ambitious, make it a weeklong activity. Family members can practice each day to polish their acts. Then create costumes, invite neighbors, and put on a show. Working in pairs, you and your kids can use different body parts to balance. Clear some space for safe play. Switch positions. Sitting on the floor -- back-to-back, feet flat on the ground -- lock arms and push against each other to stand up together. Then sit down. 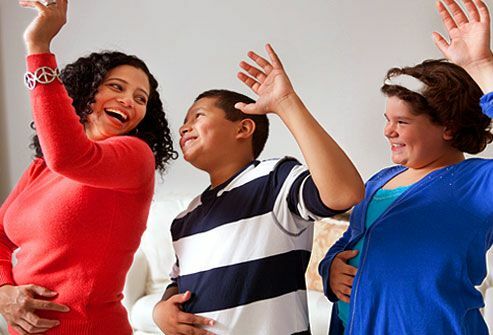 Any gaming system can become more active when you encourage kids to stand and move while they play. Or choose an “exergame,” where moving is part of the game, such as Dance Dance Revolution. Kids dance on colored arrows on a step pad, following visual and musical cues. Other gaming systems let you play different sports, including snowboarding, tennis, and tennis. You say your house is a zoo? Then get your kids moving by pretending they're different animals. They can inch along the floor like worms, jump like kangaroos, kick and buck like wild horses, or creep like crocodiles, dragging their legs behind them. Have them slither or hop under, on, and around furniture. Wheelbarrow race. Walk on your hands while your partner “steers” by holding your legs. Beanbag race. Walk-race with a beanbag on your head or clutched between your legs. Crab race. Sit on the floor so your feet are flat, put your hands on the floor a little behind you, and push up onto your hands and feet. Scuttle backward or forward to the finish line. 1. Sit in a cross-legged position. 2. Put one foot on top of the opposite thigh. Do the same with the other foot. 3. Or place feet in a way that's comfortable (like the photo) to keep knees touching the ground. Your kids can have fun with the same games you played when you were their age. 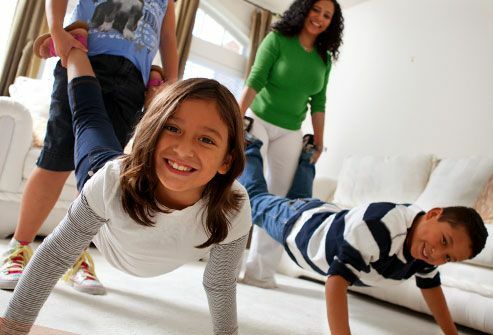 Simple activities like hide-and-seek and scavenger hunts can offer great exercise indoors. Give “follow the leader” a fitness makeover by focusing on activities such as jumping jacks or running up and down stairs. You don't need snow to let your kids have a snow day. First, clear away breakables. Then, make snowballs by wadding up white socks, scrunching paper or tissue into balls, or squeezing and taping cotton balls together. 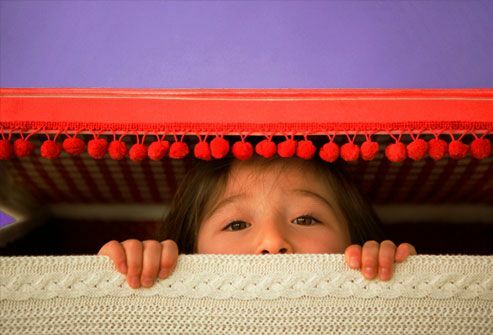 If you want to really get serious, let the kids build forts with pillows, empty boxes, and blankets for hiding. Then stand back as they launch their attacks. 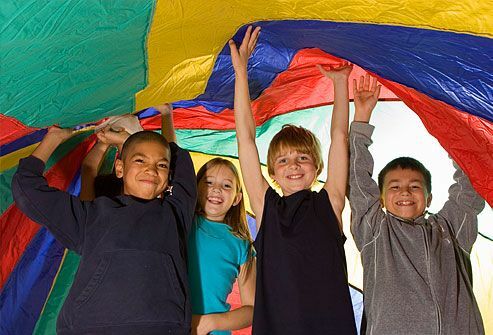 You don't need a parachute to play fun parachute-style games -- all you need is a bedsheet, a large space like a garage, and a group of friends. Try putting balls on top of the sheet and have kids shake it vigorously to “pop” them like popcorn. 1. Have everyone lift the “parachute” high. 2. Get two people to try to run underneath and trade places before it comes down. Big Brothers Big Sisters of San Luis Obispo. Buckley, A. The Kids' Yoga Deck: 50 Poses and Games, Chronicle Books, 2006. Parents' Choice: Children's Media & Toy Reviews. The New International Standard Medical & Health Encyclopedia. YMCA of Northwest North Carolina.